I loved the sweet feelings that flowed at the end of the reading Sunday. That is what reading and talking about Jesus does. Truly, there is something about that name. You could feel the Life when you were praying for our family, while Brother Gary was playing in the background. You could barely hear Gary, but the feelings of the song were “loud and clear”. It’s about Jesus and his Father. I felt such a deep appreciation for Bob, John David, and Stuart “livestreaming” for us who could not be there. I know our hearts were there, and the fellowship and love of the Spirit was there. It is not a small thing to witness and or feel the Spirit when it moves. We are blessed. Just about every book has some kind of intro or preface. I feel that this book about the Father and the Son is the preface of love for your upcoming book, The Iron Kingdom. It reminds me of how John the baptist was the “preface” to Jesus’ ministry to Israel. Then Jesus came and taught Israel, with words and with power, about the Kingdom of God. This book will introduce (again), the truth about Jesus and his Father to His children, and then open those feelings (to all who want it) to see the truth about the evil that has been done to Jesus by the Iron Kingdom of Christianity. I was glad to hear that you are going to have a hard cover for this book. It would be something to tie (in some way) the hard cover of the F and S book, to the cover of The Iron Kingdom book. To me, it just feels these two books would go hand-in hand. I want to make sure I understand today’s Pearl. Jesus never made anybody get the holy ghost, but he did say “You must be born again”. Does the fact that the person, in this case, is asking if they have to have the holy ghost mean that they really don’t want it? 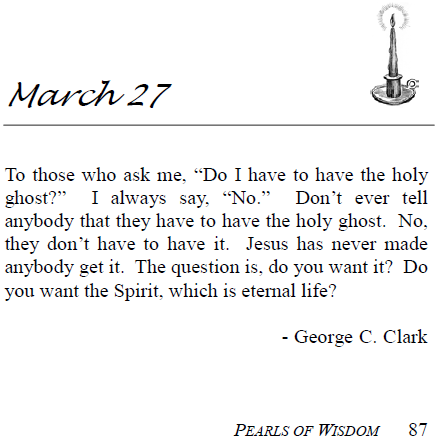 And your father was pointing out to them that if they don’t want the holy ghost, then they don’t want eternal life? So in a roundabout way, he really was telling them that, yes, you do have to have the holy ghost (if you want to escape damnation and have eternal life)? This is a distinction that I have tried to get across many times, and it is an important one to make. To communicate faithfully what Jesus said to Nicodemus, we have to add in brackets what he and Nicodemus understood was the case: What Jesus was really saying is this: “(If you all want to live forever in peace with God, then ‘Ye must be born again. )'” He was not making a demand that they receive it; he was making them a loving offer. Part of what God considers to be truly fasting (Isa. 58) is that we “put away the yoke”; that is, we stop demanding that others do what we want them to do. Our will for people, even if ti is the best thing for them, becomes evil when we try to impose it on them. God does not do that, and neither do those who are like Him. When Jesus told Nicodemus, “Ye must be born again”, it was his attitude that made what he said good. He spoke from the heart of a servant, not of a master. My father’s point was that God gives people a choice. People do not have to repent and receive God’s Spirit. But it will help them make the right choice if they are told the truth; namely, if they want eternal life and peace, then they “must be born again”. And it is only when we repeat those words with the same humble attitude which Jesus had that we are really saying what Jesus said. I just wanted to say how much I enjoyed the reading last night. I had forgotten this was the section about Job, and as we read on, I could feel my excitement as we got closer to the parts where God explains what he was doing with Satan. As we were sitting there reading and enjoying what we had been shown, I could feel, for a very long time, a sensation of chills running over me. I had the thought, ‘Oh, I’m getting a little chilly’. But as we sat there and read and enjoyed it, I realized that it was the spirit of God running very faintly all over my body, and for quite a long time. It felt soo good. Even still after I got home, I kept replaying what we had read and heard and felt last night. It was a very good thought to me, when you said that as long as we think we have any bit of control of a situation, then we are not fully trusting in the Lord, and that we have not fully given it to Him. (I think that is how you said it) It is the human nature to “keep things under control” in our own realm of life, and where we have control of daily, even hourly and minutely, situations. But truly letting Jesus guide our life is always seeking His will. We really don’t know anything without Him. We don’t know how to be a good wife or husband, sister or brother, or anything else without Him. Last night really was good to my soul! p.s… Cliff and I won’t be there Wednesday night. He is in Hickory all this week for school, and I am going up on Tuesday night and spending the rest of the week with him. Aww…I hate that. Last night was so good! Thanks, Julie. Rob and I were talking today about how the feelings from this weekend followed us home and have continued. So you were not the only one feeling that way! Concerning the point I was making, as long as we think we have something to add to God, any advice or wisdom concerning any particular situation, we really haven’t fully realized that we know nothing without His help. He really is our only hope – BUT He is enough! He loves us, and He is enough. Hope you and Cliff have a wonderful week together. Thanks for writing. “It’s never ‘yes’ or ‘no’ – – it’s GOD!” Mmmmm, love it! How serious it is to take the vow of God and become His people. I remember how Bro. Glen loved Deuteronomy 28, where the blessings and the curses were listed. I don’t want to forget that it is not just blessings we receive when we enter into the oath of God, but also curses if we do not obey Him. It was very sobering to read these scriptures and be reminded of my vow to God and His vow to me. I am loving the Father and Son material. What a book it is going to be for God’s people! I know that it is only by the grace of God we believe what He has shown us. I pray His grace will touch others’ hearts to hear and feel what is in this anointed book. When you were reading concerning the story of Job tonight and paused because it was so good, my mind was on how much God is purging our hearts of Xty’s story of Job. And Xty’s story of God . . . . and even Satan! Oh, my, what thankfulness I feel right now! It is all so overwhelming – – – and good! Listening to these radio programs are such a blessing! Several times this past week I’ve been blessed in the car driving to work. Well, this morning I had the newest ones (5&6) playing and when the song “He’s a refuge for me’ came on the power of God hit me–tears flowing, speaking in tongues, dancing in my bedroom & joy in my soul! I’m very thankful for the time that is being put into the radio programs! It’s been worth it just for me, and I pray God’s people will feel the sincerity and the love of God in it as well. I am going to put this…or similar… on my website. Thought I would get your input, if any. I used to be able to teach around the truth, and now find that is not right or possible anymore for me. Since I am ‘rather new’ and learning at my age, I need to check with someone, YOU, who knows the truth and has been living it for years before I put it online and it may be wrong. So, here is what I have…and when I hear from you I will format it properly and post online. No hurry. As mentioned on the Home Page, there will not be an overflow of Scripture quotes here…but in the future there will be some. For now, we are only stating facts as they are. When I was a young child, the teacher nun explained that the Trinity is a ‘mystery’ and we must have faith to believe it without question. She further ‘enlightened’ us by telling us that the Trinity was like 3-in-1 Oil. At that young age I had no idea of the composition of that oil and I still do not know, or do I need to know. So, to put it simply, from that (clear?) explanation, I understood that God was a mixture of three beings, spirits, or whatever. Too confusing for my young mind at that time – and it still is. So, to resolve my young confused mind, I just put it aside and accepted that teaching. Just so you know, and I do not want to lead you in the wrong direction, God is NOT made up of oil nor is He to be compared to oil. Now I have come to a place where I realize the Truth about this mess! It is so simple, so real, and not confusing. God is God. Period! God the Father is a being. Jesus is His eternal Son. Remember the quote about ‘In the beginning was the Word . . . . . ‘. So far, so good. Simple, isn’t it? Spirit: The standard of life, the spirit of life. It is the life force within our being. HOLY SPIRIT is really so simple. It is the Spirit of God. His life force. That Holy Spirit is the Gift Jesus said he would leave with us. The Spirit of God, the HOLY Spirit. It was decided by the Council of Nicaea in 325 that belief in the Trinity is to be the norm. Some bishops and others were teaching that belief prior to the Council. A council is a committee – a group of people making decisions. I suppose the fine gentlemen just knew better than God who or what God is, so they voted and now God is what they decided. I wish this kind of simple truth was posted on billboards across America and around the world. How God’s people need to know Him, not the foolishness that men have said about Him. Thank you for helping to hasten that great day! God give you health and a long life, brother. 2. For he shall grow up before Him as a tender plant, and as a root out of a dry ground. He has no form or comeliness, and when we shall see him, there is no beauty that we should desire him. Just wondering. When Isaiah says “and when we shall see him”, is the “we” he is talking about, people after Pentecost who believed and not those who rejected the Son? What point in the future is he addressing? Isaiah is referring to the way Jesus appeared to the Jews during his ministry on earth among them.